Arcturus, or Alpha Boötis, is located about 36.7 light-years from Sol. It is the brightest star (14:15:39.7+19:10:56.7, ICRS 2000.0) of Constellation Boötes, the Herdsman or Bear Driver, forming his left foot. Furthermore, Arcturus is the brightest star of the northern hemisphere in Spring and the fourth brightest star in the Earth's night sky. Its name is a variant of the Greek for "Guardian of the Bear" -- the Great Bear of the northern hemisphere known as Constellation Ursa Major. 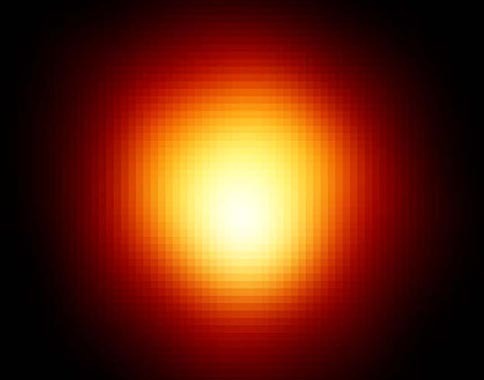 Although satellite observations by the HIPPARCOS Space Astrometry Mission in the 1990s indicated that Arcturus might have a stellar companion, analysis of more recent observations suggest that it is a single star (Turner et al, 1999; in pdf). With the exception of Alpha Centauri, Arcturus has the largest proper motion (2.29" in PA 209°) of first magnitude stars observed from Earth. This motion was first detected by Sir Edmond Halley (1656-1742) in 1718. According to Robert Burnham, Jr. (1931-93), Arcturus is now at its closest proximity to Sol, having become visible at about half a million years ago but will fade from view in its motion toward Virgo in another half a million years. It may have been the first star to be observed by telescope in daylight, by Jean-Baptiste Morin de Villefranche (1583 - 1656) in 1635. The star is the title member of the Arcturus group. Arcturus is a orange-red giant star of spectral and luminosity type K1.5 IIIpe. The star has a mass that may be around 1.5 times Sol's (see Professor Jim Kaler's Stars page on Arcturus ), at least 24.5 times its diameter (0.019 - 0.027", according to the Yale Bright Star Catalogue, 1991 5th Revised Edition notes entry for HR 5340), and 113 (visual) to 215 times (with infrared) its luminosity (James B. Kaler, 2002, pp. 21-22). It is only 17 to 32 percent as enriched as Sol with elements heavier than hydrogen ("metallicity"), based on its abundance of iron which includes Fe-0.5 (James B. Kaler, 2002, pp. 21-22; and A. S. Gaudun, 1994). The European Space Agency has used ultraviolet spectral flux distribution data to determine stellar effective temperatures and surface gravities, including those of Arcturus. 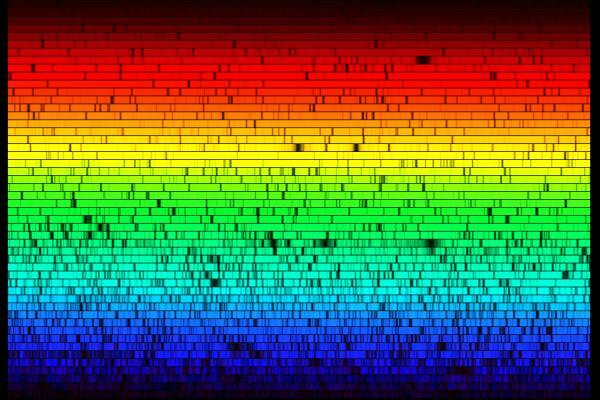 According to Robert Burnham, Jr. (1931-93), the star's spectrum "rather resembles [that] of a sunspot." © Association of Universities for Research in Astronomy, Inc. (AURA). All Rights Reserved. 53 probable members of a group of old disk stars appear to be moving with Arcturus (O. J. Eggen, 1971). Arcturus may be a Population II star and a member of the Milky Way galaxy's thick disk. The thick disk is generally formed of old stars that may lie several thousand light-years (ly) above or below the galactic plane, unlike thin disk stars such as Sol which typically lie within a thousand ly. Such stars tend to have larger apparent motions, with rapid passages in highly inclined and elliptical orbits around the galactic core. Their movements tend to pierce the galactic disk that Sol moves within, leading to a large relative motion. As they were born when the galaxy was less enriched or outside metal-rich thin disk areas, such stars also tend to be low in "metals," averaging around 25 percent of Sol's. Thick disk stars make up only about four percent of all stars in the Solar neighborhood (Ken Croswell, 1995, page 62). Professor Jim Kaler suggests that Arcturus may even have originally been born in a satellite galaxy that merged into the Milky Way (see his Stars page on Arcturus). As the star is more massive than Sol, it has evolved faster into a helium-burning "clump" giant, possibly within five to eight billion years since hydrogen ignition (see Kaler's Stars page on Arcturus). It's sizeable mass, moreover, suggests that the star has not yet suffered substantial mass loss after leaving the main sequence onto the "ascending red-giant branch" (Ayres and Johnson, 1977). Arcturus exhibits both short- and long-period Doppler velocity variations with amplitudes of order 150 meters (492 feet) per second (Hatzes and Cochran, 1994 and 1993). It is a New Suspected Variable star designated as NSV 6603. According to the Yale Bright Star Catalogue, 1991 5th Revised Edition notes entry for HR 5340, its radial velocity varies over a 1.842 day period. Useful catalogue numbers and designations for the star include: alp or alf boo, 16 Boo, HR 5340*, Gl 541, Hip 69673, HD 124897, BD+19 2777, SAO 100944, FK5 526, LHS 48, LTT 14184, and LFT 1084. 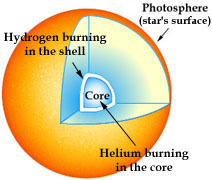 As a star that has evolved out of the "main sequence," Arcturus has fully shifted from the fusion of hydrogen to helium in at its core to the fusion of helium to carbon and oxygen, with trace activity of other nuclear processes. However, Arcturus is somewhat brighter than expected for a stable helium-burning star. Among the heavier elements and molecules detected in its stellar atmosphere have been iron (Fe-0.5) and CN. This helium-burning, orange-red giant stage is relatively brief, lasting tens to hundreds of million years (e.g., lasting around 700 million years for a star of one Solar mass like the Sun). Any Earth-type planets that orbited Arcturus during its youth probably have been burnt to a cinder and fallen into the star. Currently, the orbit of an Earth-like planet (with liquid water) around Arcturus may be centered around 11 AU -- between the orbital distances of Saturn and Uranus in the Solar System. Astronomers would find it very difficult to detect an Earth-type planet in the water zone of this star using present methods. Observations by the HIPPARCOS Space Astrometry satellite in the 1990s indicated that Arcturus might have a stellar companion. This result was unexpected because no companion had been reported previously and because the star's previously known characteristics (such as observed radial velocity variations) were incompatible with Arcturus as a binary system (R. F. Griffin, 1998). Analysis of more recent observations using the Mount Wilson 100-inch telescope suggests that it is a single star (Turner et al, 1999; in pdf). 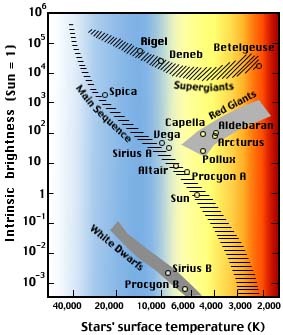 The following table includes all star systems known to be located within 10 light-years (ly), plus more bright stars within 10 to 20 ly, of Arcturus. Try Professor Jim Kaler's Stars site for other information about Arcturus at the University of Illinois' Department of Astronomy. Up-to-date technical summaries on this star can be found at: the Astronomiches Rechen-Institut at Heidelberg's ARICNS and the Nearby Stars Database. Additional information may be available at Roger Wilcox's Internet Stellar Database. Most of the stars in Boötes form a kite-shaped figure near the Big Dipper's handle (or Big Bear). Hence, a nightwatcher can imagine that Boötes is chasing the bears (Constellations Ursa Major and Minor) around the North Pole with a pair of hunting dogs (Constellation Canes Venatici). For more information about the stars and objects in this constellation and an illustration, go to Christine Kronberg's Boötes. For an illustration, see David Haworth's Boötes. © 1998-2007 Sol Company. All Rights Reserved.